Is there anything different about the air down there? Many claim that the depth of the Dead Sea gives the air something special that helps treat psoriasis. Is it just the depth? We often hear claims that since the Dead Sea is so far below sea level, the extra atmosphere protects bathers from being sunburned, and so they can stay out all day soaking up rays, treating their psoriasis. What makes this claim less than true? The fact that 400 meters of air doesn’t mean a whole lot, that’s what. Since the Sun’s rays are, for our purposes, parallel, then near the equator (A in the diagram), the light goes through the least amount of UV-absorbing atmosphere. In the mid-latitudes, it’s somewhat more (B), and near the poles (C), the path is the longest. The route by which sunlight reaches a person is called the solar optical path, and its length is what determines the amount of UV reaching the ground. The Earth’s atmosphere extends to quite impressive heights, but we’re only concerned with that portion of it which has UV-absorbing properties. This extends upwards only about 50 kilometers. We’ll call this the UV solar optical path, or UVSOP. It’s easy to visualize that any point on the Earth at sea level which is directly “under” the center of the Sun has a UVSOP of 50 km. This is the smallest amount of atmosphere UV light can possibly go through to reach sea level. We can calculate the length of the UVSOP to the Dead Sea. Now, since the tilt of the Earth causes the calculations to get messy, I’ll focus on how long the UVSOP is for various points during an equinox (spring or fall, doesn’t matter). Time of day also makes a big difference, so for now, I’ll stick to noon, when the path is always shortest. 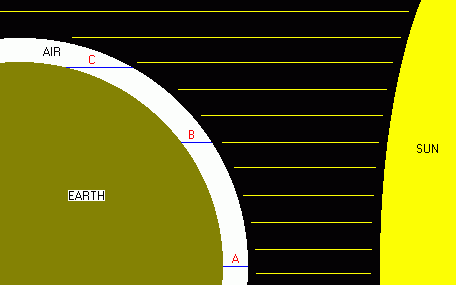 Where R is the radius of the Earth (6370 km), H is the average depth of UV-absorbent atmosphere (about 50 km), L is the latitude of the geographic position in question, and P is the resultant UVSOP length (in kilometers). and wind up with a fully-qualified value, V, which provides a decent approximation of the length of the UVSOP at noon during an equinox, at almost any position on or above the globe. Extremely high altitudes and/or latitudes will invalidate this approximation. It also ignores the oblateness of the Earth, along with daily (and seasonal) fluctuations in atmospheric depth, but these things should be of little consequence. Now, since the Dead Sea is around 400 meters below sea level, and at a latitude of 31° 30’ North, V is easily calculated to be around 58.897 km. For comparison purposes, V is 58.556 km at the same latitude but at sea level, so the depth of the Dead Sea adds only about 341 meters to the UVSOP there, or about six tenths of one percent of its total. This is negligible. What other points on Earth share the Dead Sea’s solar optical path length? Well, anywhere at sea level at 32° 2’ 35” North latitude, for starters. That’s about 60 kilometers North of the 31° 30’ figure, or just 37 miles. And that is just one reason why it is wrong to say that the depth of the Dead Sea adds “protective” or “filtering” atmosphere. It does, but the difference is trivial. The same amount of protection can be had by moving to a slightly different location. Heck, the solar optical path for the Zero Milestone on the lawn of the White House in Washington, D.C., is over five thousand meters longer than that of the Dead Sea, but you don’t see an above-average amount of psoriatics hanging around the Ellipse sunning themselves. As I mentioned before, time of day plays a large role in how much UV is getting to the surface. Obviously, at night the amount is near zero, but during the day the angle of the Sun plays the foremost role in determining the UVSOP at any point. The equation above only takes into account the angle due to latitude, but it should be obvious that near dawn or dusk, the Sun is very low in the sky, while at noon, it’s at its highest. In this way, UVSOP lengths are affected by time in just the same fashion as they are by latitude, since time can be easily converted into degrees of longitude. Noon at the equator, the UVSOP is about 50 km. Anywhere along the terminator — that “line” which separates day from night — the UVSOP is at its longest, that same 800 km figure cited earlier for the poles. And in-between times, 10 AM for example, the UVSOP is somewhere inbetween those extremes. The equations taking time into account get messy, and if you’re going to do that, you might as well add in the parts to handle the 23° tilt of the Earth, and I just don’t have the heart to do it. It should be clear, now, why in most places, sunbathing is discouraged between 10 AM and 2 PM — that’s when the UVSOP is shortest, and there’s the least amount of protection from the air above. It should also be clear, now, that the amount of UV at the Dead Sea will vary wildly over the course of a day. The UVSOP at dawn or dusk is around 13 times longer than the UVSOP at noon. 400 more meters of air doesn’t mean much of anything compared to the dozens or hundreds of kilometers of air the light has already been through. I should note that this is just one small aspect of the claims made about the Dead Sea and its environment. Other factors could easily (and probably do) play a role in making it the psoriatic “Mecca” it appears to be today. I’ve read, for example, that it tends to be hazy there. And I’ve seen the research done on the high bromine content in the air near the ground. Whether these things really do have beneficial effects will have to wait until more data becomes available. This article is only meant to dispell just the one part — that another 400 meters of atmosphere is the key ingredient to therapeutic success at the Dead Sea. That’s nothing more than sales hype. Ignore it. Better yet, don’t hand your money over to someone who repeats it. This page created on 20021207.